Ok. So it’s a blatant Juneathon (exercise-and-blog-every-day) fail. Tooth infection and subsequent extraction put a halt on things for a while. I can live with it compared to how it was. So if it’s still not right then, I’ll get it sorted. I was down at the tennis courts again yesterday though and played a couple of sets while my son had coaching on the other court. Today, has been a heavy gardening day, though I’m currently taking a break, doing this, and watching Murray/Wawrinka on the telly-box. I’ve just had a nice delivery, too. Do you remember ‘BOUNTS’? I wrote a blog about it once. 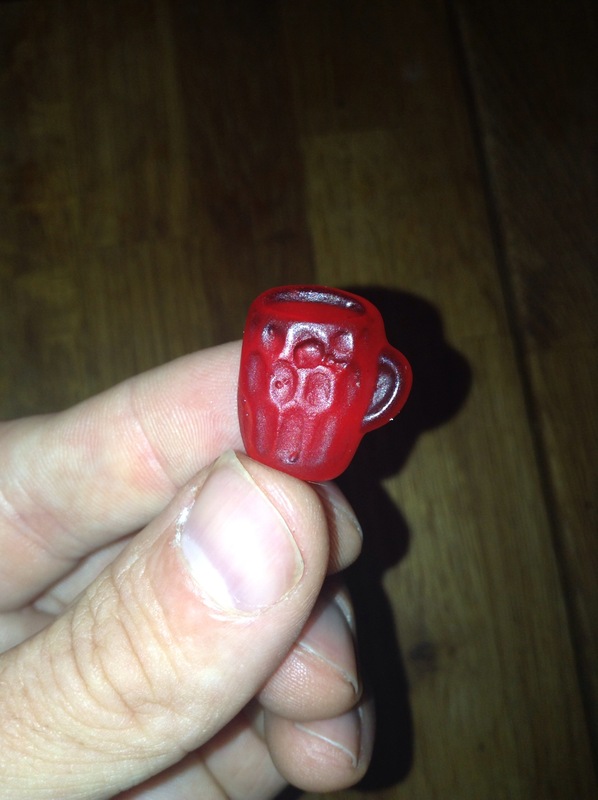 It’ll be out of date now, in the sense that it WAS amazing… But it was too amazing and collapsed under its own success. You basically did tracked activity/sport/steps etc linked to your Garmin/fitbit/etc and you got points. When you had enough, those points could be directly exchanged for actual monetary vouchers. I exchanged mine and got £15 sent to me a couple of years back. I guess (and this is purely a guess) they accessed these themselves through advertising revenue. I would have exchanged points again because I had loads of them but Bounts never had any stock to give anyone. People got upset. Personally, I didn’t. It was frustrating, yes, but it was all free. I’d not lost anything. Except, some people had lost out. Bounts offered a premium service which did cost, but meant you earned points more quickly. Earning points quickly is kind of pointless though (pun intended) if those points can’t get you anything. Bounts basically had too many people on their books, all with loads of points, all wanting to exchange them for vouchers that Bounts didn’t have. So they changed their model. Some people, (though, I understand, not all) who paid premium, got a refund, and vouchers were no longer available. The company now offer an entry into various competitions to win prizes if you manage to complete the accompanying challenge – e.g. Run 20 miles over the month; do 10,000 steps every day for a fortnight; cycle 5 times in 30 days, etc. To cut an already long story not a lot shorter, I won one of these competitions! 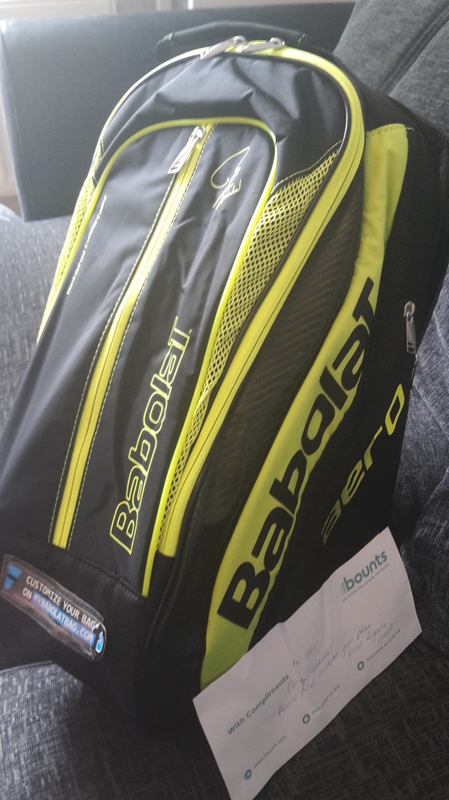 I’d played tennis the required four times in May and along with a few other people* I won this funky tennis backpack! Well I think it’s quite a good, funky design feature anyway. For balance. Also check out, Running Heroes (link included, but I think they might be entirely app-based now) – they also do challenge-based competition entries. I think I’ve won a pair of socks and a £20 voucher through them. Incidentally, mentioning ‘balance’ reminded me, New Balance used to send me stuff for free to review on occasions but in my efforts to be honest in my reviews (I didn’t really think the last pair of shoes they sent me were great for running), I… Errr… Don’t really hear anything from them now**. Oooops. 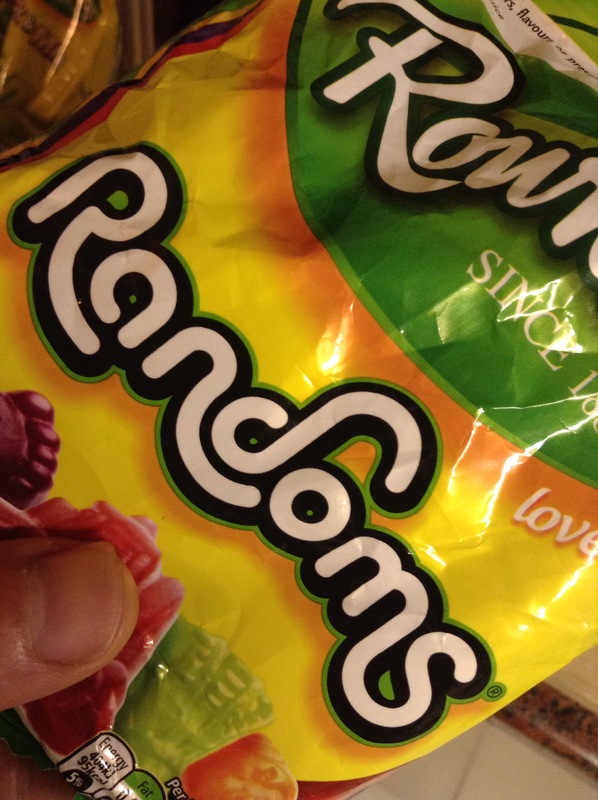 *as in, other people also won a bag. I did not win other people as well as winning a bag. **Maybe they found out only 3 people read this. That could be it, too. 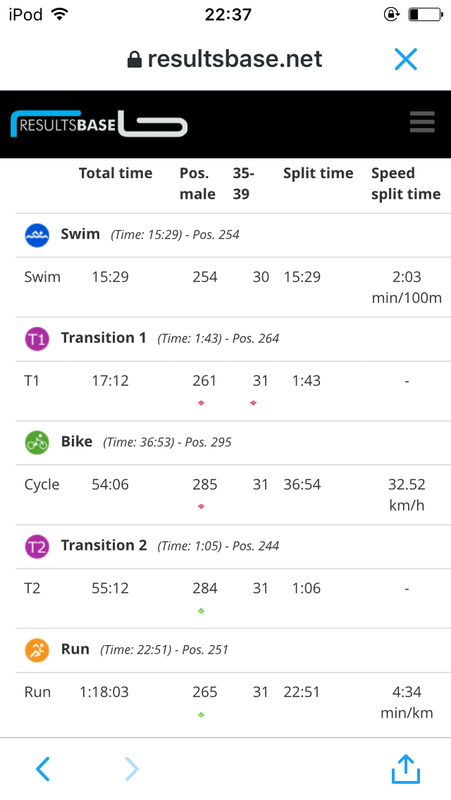 So my last blog post was a short introduction to how I intended to beat my younger self at this year’s triathlon. I suppose, to be honest, it wasn’t so much how as just that I had that idea. There was no plan as such. Just an intention to swim hard, bike hard and run hard and then generally hope that I’m fitter and harder than I was four years ago! The first thing to note is that I did fit into both my tri-suit and my wetsuit. Four years on from their last outing this was no mean feat… unless by ‘mean’ you actually just mean ‘average’ in which case, that’s exactly what it was. But I was s bit worried about that do it was indeed a good start. The timing of the swim start had been changed due to a course change upon the discovery of some blue-green algae in the lake. They needn’t have bothered as I am colour-blind anyway and besides, the water was so murky you couldn’t tell what anything was. I swam the swim ok, but my snug wetsuit seemed to make lifting my arms out of the water really hard. I would also get stupidly dizzy and need a few strokes of breaststroke just to stop the world spinning. I alternated between this and front crawl until the exit gantry, where I then proceeded to try and remove my rubber onesie while trying not to fall over! 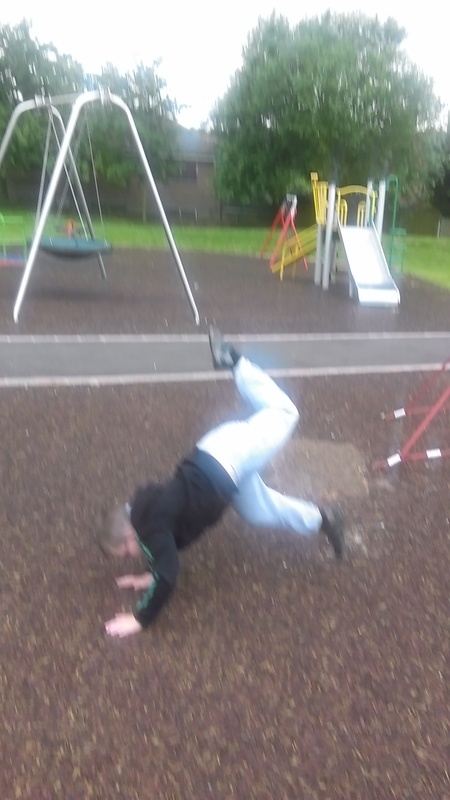 Proper dizzy! I later found out my son, watching, was saying, “What is he doing?” Upon viewing my antics. This felt straight-forward… with a few corners thrown in. Four laps of not crashing. 20km. I was never going to be super fast on the bike but I overtook a few people and was overtaken by a few different people… though I consoled myself with the fact that most of these were not in fact ‘cycling’ so much as ‘piloting futuristic looking spacecraft’. I’m sure I would have overtaken myself if I was piloting futuristic looking spacecraft too! 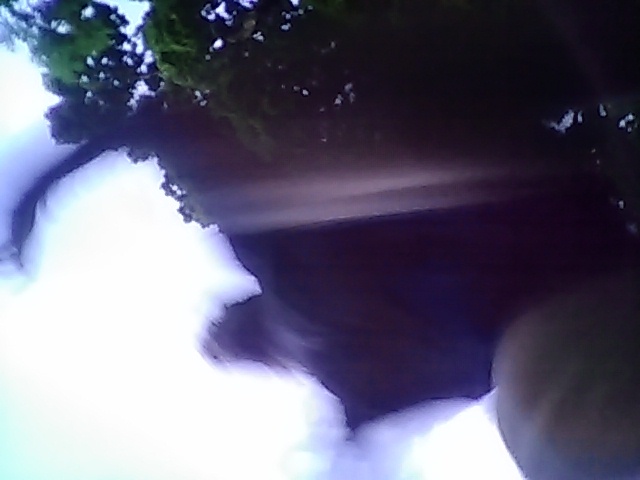 I did one of those clever, off the pedal – straight into running with the bike -dismount thingies, but I think I was going a little faster than I thought because my legs had to work like billy-o to prevent immediate face-planting embarrassment. This must weirdly have had it’s benefits though as I settled into a steady running pace that I thought I could sustain for the next 5k and a glance at my Garmin told me this was 7:45/mile . Pleasantly surprised with that so I stuck with it. I slowly picked off a few runners and didn’t get caught by anyone (that I remember) which felt good (obviously anyone faster than me at running was also faster than me at swimming and/or cycling). If I continue at this rate of improvement I shall be winning this event by the time I am 55 years old! Many thanks to the family for cheering on the chubby bloke in a leotard, and to the marshals – who incidentally were lovely to me (the friendly, law-abiding triathlete novice) but who had to deal with a few trumped-up numpties, I heard. It is now June… Which in the past has meant JUNEATHON which has meant daily blogging. I can’t see that happening…but maybe a few more regular ones this month. Last night I went straight to the tennis courts after work and left there 4.5 hours later. Lovely. Lost a big match after going down 9-7 on a tie-break. A bit gutted, but a great game. Not been doing much running this month, to be fair. Not in terms of miles anyway. It doesn’t look like I’ll be entering the Nottingham marathon this year. I said I’d only enter if I managed to shift 10kg. I think I need a bit of a break. No pressure. No goals. Just enjoy the running. Or not running. 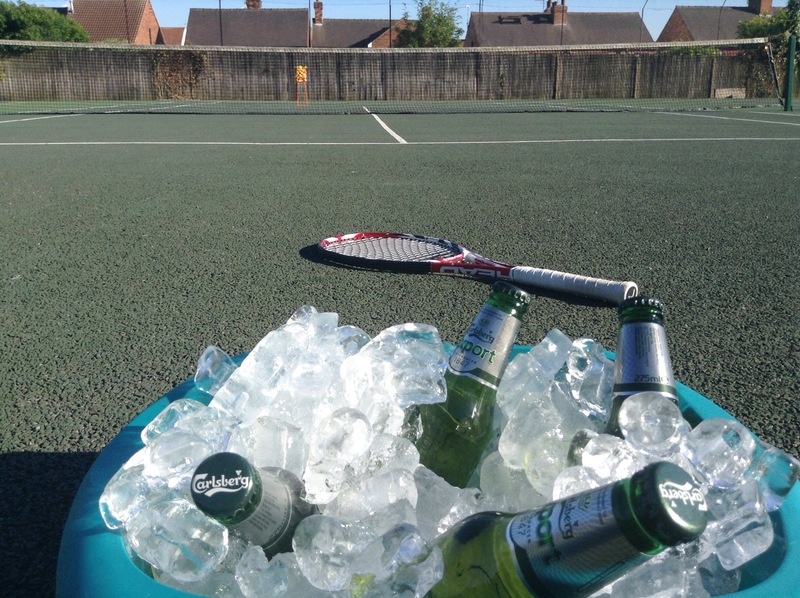 Time to sit back, relax, enjoy Wimbledon. Normal service of only occasional random blogging (sometimes about running) now resumes. 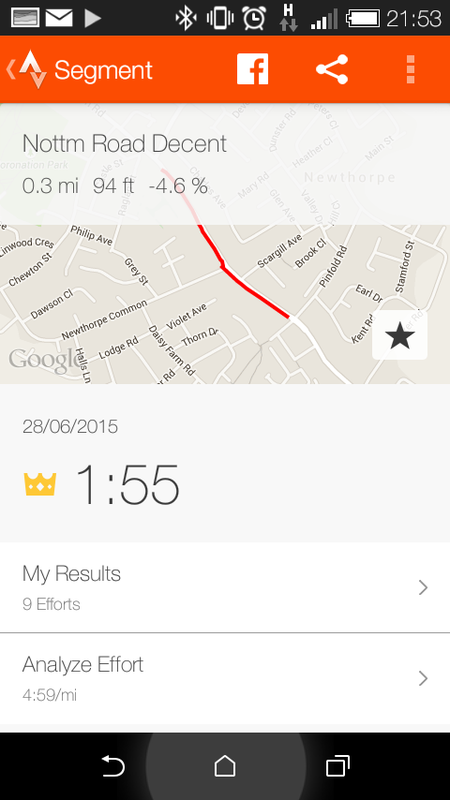 Or “Uh oh” …Or whatever it was I was emailed by Strava recently, telling me that MY course record had been STOLEN! Well, I’ve only just gone and nicked it back haven’t I! Eh? Yeah I have! Take that, course record thief! Ok…So it’s only 0.3 miles and less than 2 minutes running. Ok…So it may have reactivated some dormant asthma condition that I was previously unaware of. Mwaaaa haa haa a ha ha haaaaaa!! I was so up for a parkrun this morning. ‘Up’ mentally, and ‘up’ physically… I’ve been getting faster and fitter (just not any lighter… But that’s all part of my cunning training strategy!). …Well… nearly everything. After yesterday’s ‘out of the house all day’ adventure with the kids, we ordered in a pizza that evening. It was lovely. And then everyone went to sleep. Which was also nice…but it unfortunately meant that this morning, there was all the morning stuff to do plus all of last night’s ‘last night’ stuff to do, there was no milk, hard-working wife still had hard-work to do, the kids were up, tennis coaching and ballet lessons awaited the little people and the in-laws were due round at some point today too. I should have done it last night. Then I could have been off and out this morning. 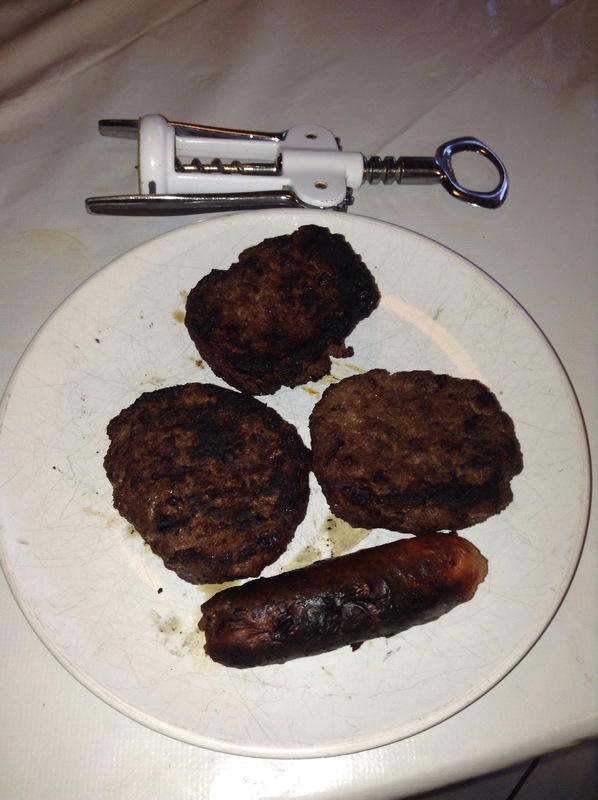 …this included eating a cold slice of pizza. Having taken Child1 to tennis, I met a fellow club member there and we ended up playing a set ourselves so I did at least get some decent exercise in. As a bonus, Bounts – the website I have reported on before where you can earn points for exercise – redeemable for real world cash gift cards (sign up here for 100 points to get you started), have recently started magically recognising my attendance at my local tennis club and awarding me attendance points too. That would have been extra handy if it had started a month or two back, based on how much I’ve played recently. After lunch I took Child2 to ballet, did some food shopping and then I’ve spent the late afternoon cremating meat on the BBQ and drinking cold beer with my wife and her family. There are worse ways to spend the last part of the day. After great anticipation and a build up worthy of a child with their first chocolate advent calendar… Friday 26th June 2015 was international handstand day! 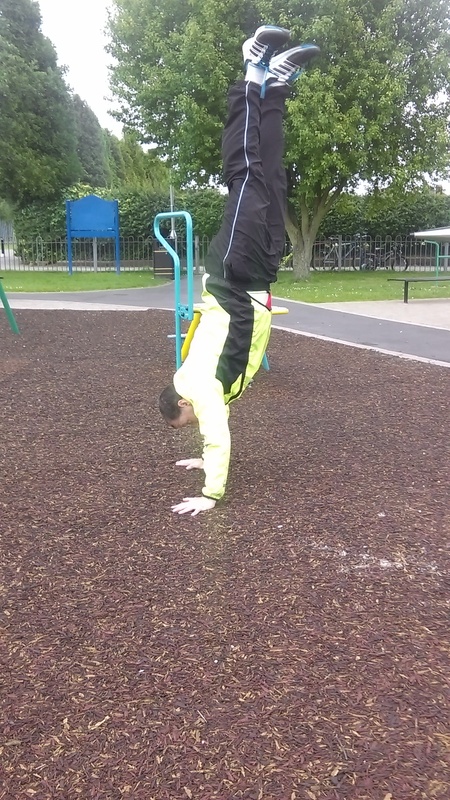 It was also an inset day for the children (for my international readers, joining me today in celebration of international handstand day, an inset day = teacher training – i.e. No children in school/nursery). So I had them both to myself for the whole day. I am a lucky dad. These are the kind of days I like. The only request from either child was that we went swimming at some point. My only request was that at some point I should do a handstand to mark international handstand day. My original plan, having checked the swimming timetable, was to leave the house early, cycle to the swimming pool together, swim, then cycle off somewhere for a picnic lunch, before then some mad adventure in the afternoon. There was, however, plenty of morning faffing top be done; picnics to be made; children to be woken and breakfasted; bikes to be oiled, brakes checked and seats raised (these little people don’t stay little for long, do they? ); and handstands to be attempted. 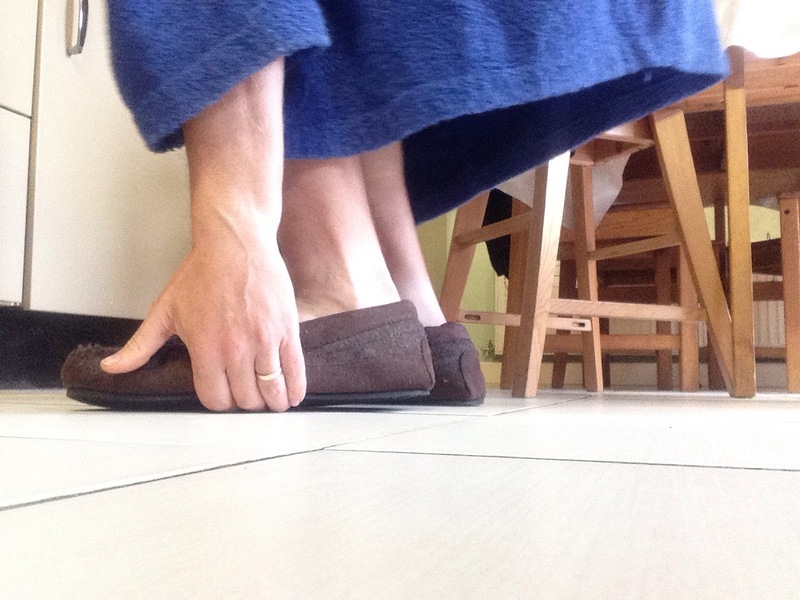 WARNING: below is photographic evidence of me attempting to stand on my hands in the morning in a very lose-fitting dressing gown. 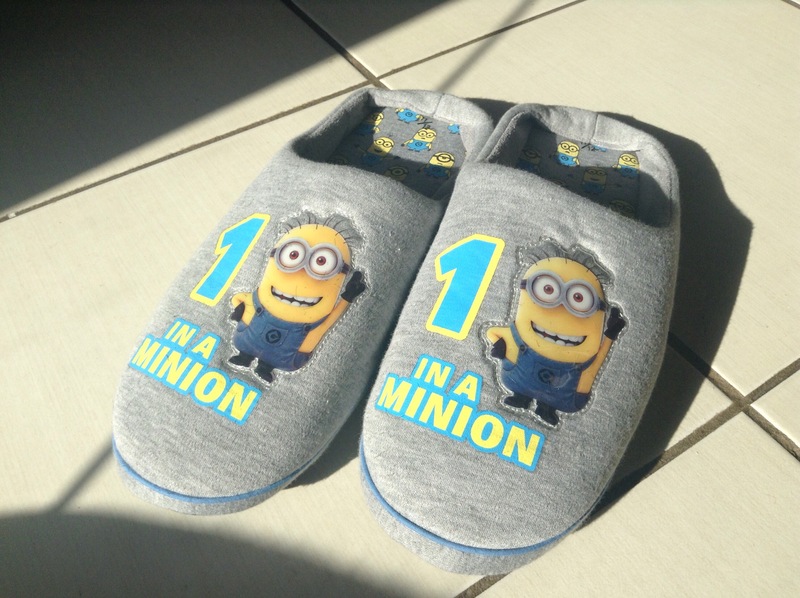 I have taken care to obscure my face from the photograph but I am wearing nothing else apart from slippers (which I was kindly bought recently for father’s day – I’ve got some ‘Minions’ ones too, but I’m not wearing them). YOU HAVE BEEN WARNED! Are you sure you still want to do this? I was actually pleasantly surprised that I could still bend down to my toes. Go me! 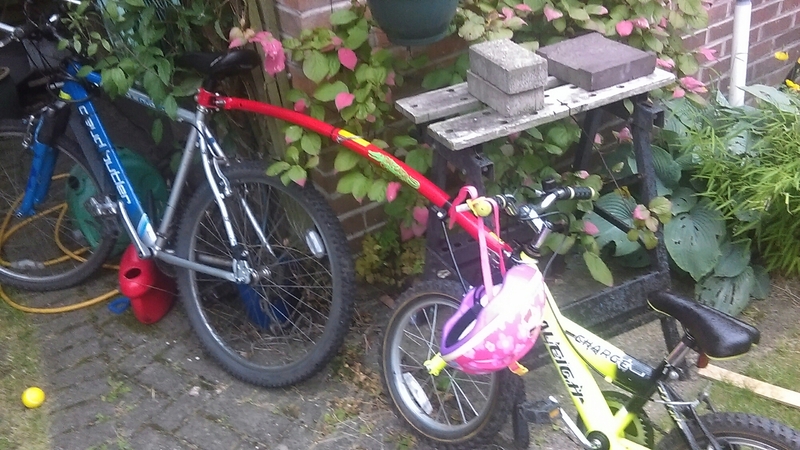 But eventually, the kids persuaded me to stop being such a wuss and just start pedalling. We had a great time cycling and then swimming, with Child1 managing 50m front crawl at the end of the session to ‘earn’ (they were going to get one anyway) him and his sister a treat from the machines in the foyer after the swim. She isn’t yet swimming independently but happy to be in and around water. Next, a short cycle to the park for picnic (now about 1:30pm) as despite machine treats, we’re a bit peckish. A basic understanding of the laws of physics will betray the fact that neither my own or my son’s (sorry- but especially my son’s) attempts held ‘form’ for more than a mere fraction of a second. We spent ages on the park and I then led them off on another bike ride to a secret location. They didn’t like ‘secret location’ bike rides… But they did great. And when we got there, the cinema still had some tickets left for the newly released ‘Minions’ movie. Quick Film review: Meh…it’s no ‘frozen’ but the kids enjoyed it, so therefore I did. We cycled back home and got in literally just before the rain started. Great timing. Yesterday, Wednesday 24th June was rattling through with very little going on in the way of exercise. I’d taken some friends to the Nottingham Open tennis in the morning but I couldn’t stay, myself due to my fatherly duties (daughter collection from nursery later). It wasn’t until later in the evening, when eldest child went to cubs that I got the day’s exercise in. My good lady wife had arrived home just in time to take charge of the youngest so once I took the eldest to cubs, I could just go for a run until collection time. It was a good job too, because a minor accident nearby meant I wouldn’t have been able to drive home anyway. A 10k run later, though and with Child1 now collected from cubs, the route was clear. Wednesday – done. Squeezed in just a set of tennis in the morning but it was a good one. It took an hour and I was dripping afterwards. But when I got home, I had an email informing of a theft. Something of mine had been stolen. The email started… “Uh, oh” …never a good sign. Then continued..”your course record has been stolen!” It was from Strava. I know. I imagine you are in shock right now too… But yes, I did actually have a Strava course record. It was/is a downhill segment (naturally! Well, it wasn’t going to be anything else) and I ran it on an occasion a while back when it had just started raining very heavily and it was dark (this is important as it meant I could see if cars were coming at the point I had to cross the road). Anyway, it has been stolen from me. I will get it back. ..how do you fade out in a blog post? I remember, approximately twenty-something years ago, at school, I loved Wednesdays. Wednesday’s timetable was, I think: double P.E (yay! Love P.E!) double maths (love puzzles) and double music (love making lots of noise). Today (…well…yesterday now…but today too, actually) is not a Wednesday. Monday, at school twenty-something years ago was double hunanities. I don’t know why it was called ‘humanities‘ it wasn’t very humane to bore the pants off us students for hours and then give us ten hours of homework to do by yesterday. Well that’s how it felt. There were probably other lessons on a Monday, but they could not overshadow humanities! Today (yesterday now) is (was) a Monday. But it didn’t just feel like a Monday, yesterday, it felt like a double Monday. I was unproductive and slow and if my thoughts were spoken out loud, I’d have told myself to shut up and get out of my own company. 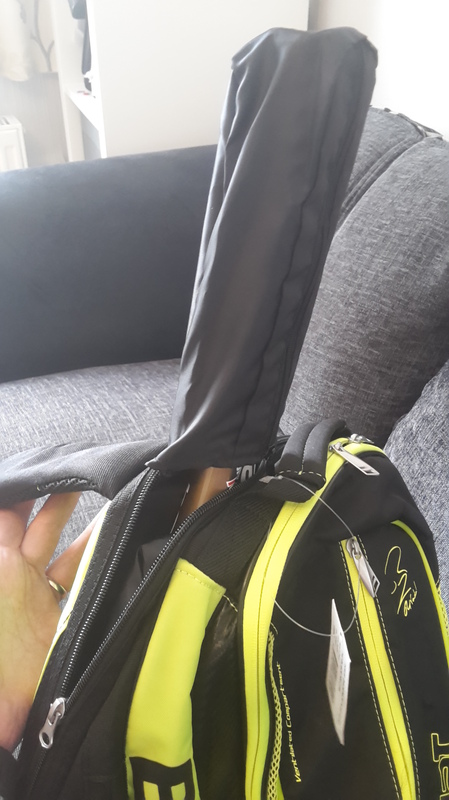 …But when I got to tennis it started tipping it down with rain, big time. So at this point, I’m supposed to tell you how I laced up my running shoes and went for an invigorating run in the rain, singing at the top of my voice, smiling at everyone who thought I was mad and brightening people’s day as I deliberately stand next to that huge puddle as the car drives by to give myself a refreshingly muddy shower and celebrate the wonder that is the sensation of life!! WoooHooo!!! On this particular double Monday…I played tennis in the rain for an hour and a half with other mad people. I didn’t post yesterday’s post yesterday, because if I did, my parents would have phoned to check I was ok. They read my blog…and they read into my blog…which is dangerous. I am ok.
Today was a different day. It was Tuesday, for starters. I felt much better today. I am considering a late night run, but having done 60 press ups in 60 seconds earlier (just to see if I still can) and therefore meeting tonight’s Juneathon requirement, I think I might go to bed early…or at least early for me. Don’t forget people (UK people at least), Friday is national handstand day – yes, seriously that is a thing. That day’s blog could be interesting. …nah!! 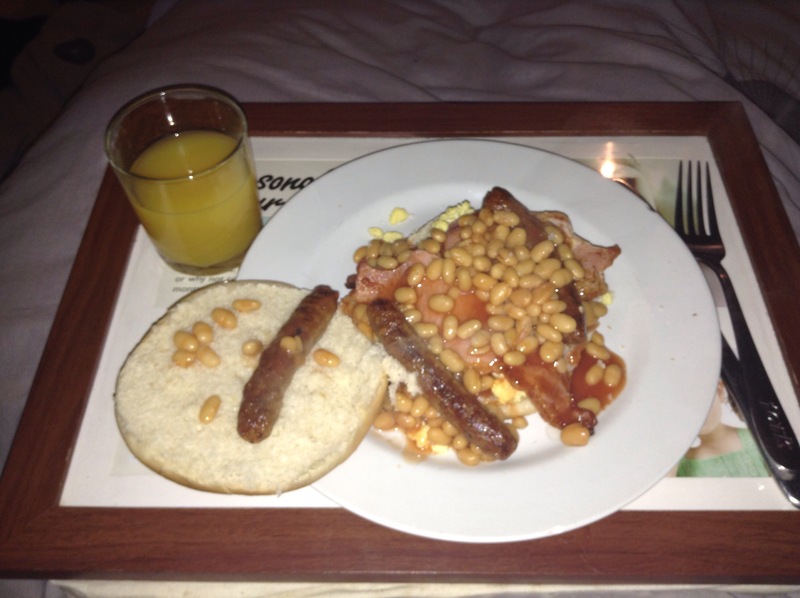 I had a lie in and was given breakfast in bed for the first time in a long time. I went on to have a lovely day – I exchanged emails with my dad (I didn’t actually speak with him but he doesn’t really ‘do’ Father’s Day so he won’t mind) who had written a great short poem about being a dad… I just thought, I could share the poem here but would want to check with him first. I played tennis (my Juneathon activity for the day) with my son and watched tennis from Queen’s …. Go Murray! Then it was dinner with the in-laws, a game or two and then bath and bed for the kids. So to complete a related exercise, I figure it’s time for a couple of bicep curls. or when to admit that you really don’t know. or when to step back and do nothing at all. Same photo … Different blog post! 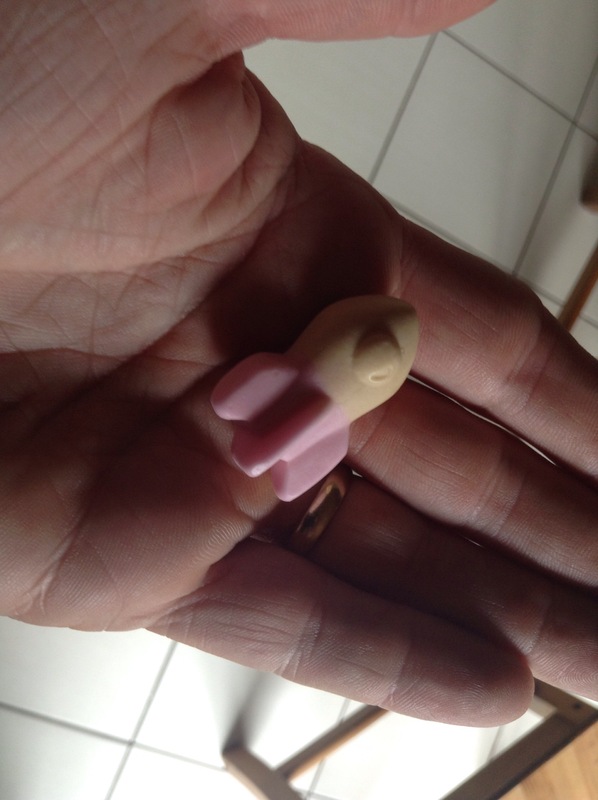 Yesterday’s random sweet plucked from the randoms packet (from which I had to elicit some sporting activity) was a tennis racquet – boring. So I trained to be an astronaut! It was suggested that I do 100 burpees because I would have to shoot up like a rocket to do them. I thought there would be very little chance of me even leaving the ground after 100 burpees so I declined that suggestion. I opted instead for the easier option of moving at 4 times the speed of sound. Well… A leisurely 20 minute run to check on a couple of our geocaches that I needed to check were still in place. On the way back, I placed my phone on the ground, set the timer, and ran over it. 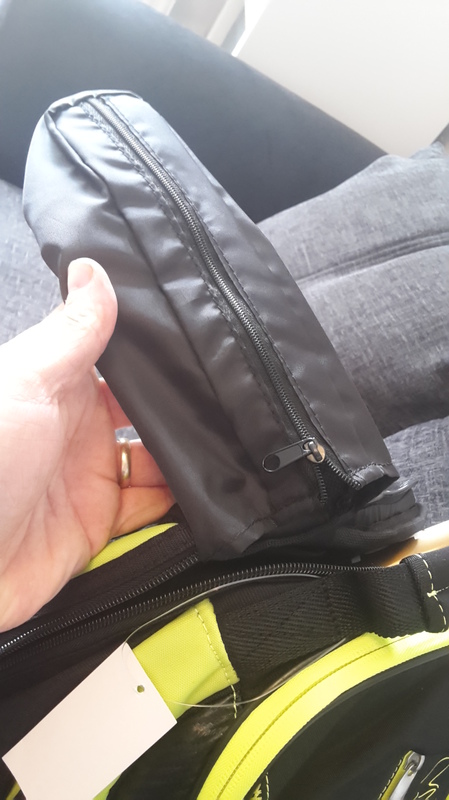 …Unlike a space rocket however (I imagine), I landed in a big pile of dog poo and subsequently did the dog-poo-foot-slide thing all the way home (which incidentally had little or no effect as I was wearing trail shoes and I’ve just forced it into the gaps). I’m left them outside and I’m hoping for a thunderstorm tonight!